British Transport Police are appealing for witnesses after a woman was assaulted on a train to Edinburgh Waverley. BTP have said a woman was slapped across the face by a man in the front carriage of a train travelling between Glenrothes and Edinburgh. The incident is said to have occurred shortly after 9pm on October 22. The man, who was white, bald and wearing a Stone Island-branded jacket, was believed to be with a larger group of men. 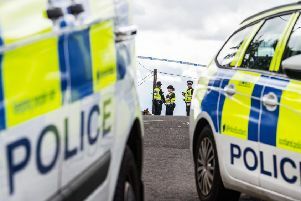 It is reported that the victim got off the train at Dalmeny Station at 9.47pm with a man, who was said by witnesses to be “sobbing uncontrollably”. The woman, who was in her early or mid-twenties, with blonde hair and wearing a bomber jacket and black leggings, did not report the incident but police would like to speak to her about what happened. Investigating officer PC Liam Harper said: “We would like to speak to the woman who was hurt in this incident as we believe it left her extremely distressed. Anyone with information is asked to contact British Transport Police on 0800 40 50 40 or text 61016, quoting 157 of 24/11.